There are only a few San Diego Transportation Companies that carry these large Limo Buses and we have partnered with all of them. Build for cross-country travel, these beasts are safe and reliable. Also, because of the size, the 56 Passenger Limo Bus and Party Buses come with every crazy option imaginable. Take our San Diego Limo Bus Rental Services 56 Passenger for Birthday Celebrations or Greek Transportation from SDSU, CSUSM, or USD. Take a 56 Passenger Limo Bus for a night out on the town, or to any of San Diego's Best Downtown Clubs. How about a 56 Passenger Party Bus for your Bachelor Party or Bachelorette Party. We also provide 56 Passenger Shuttle Buses and 56 Passenger Charter Buses for City Tours, Brewery Tours, Winery Tours, or whatever you fancy. Don't waste more time searching the internet through multiple websites and companies trying to find an available bus for your event, because we have already done that for you! We cover the most requested event services in San Diego. Our client's book San Diego Party Bus Rental Services and Limo Buses on a daily basis for everyday events and for special occasions. Feel at ease knowing that your group will get a FREE Designated Driver if needed, Curbside Service where accessible, while you sit back and relax with friends and family or party the night away in your 56 Passenger Party Bus. 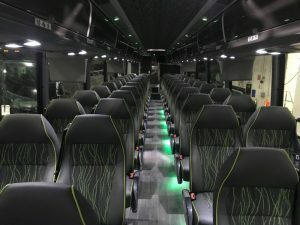 San Diego Party Bus Rentals are available for all San Diego County, South County, North County, and the San Diego Beachline. Choose any destination in Southern California with the Largest Charter Buses on the road, 56 Passenger Charter Bus. Get a Tijuana Border One Way Transfers, San Diego Cruise Port Drop Offs, or Charter your family and friends to any of The Best San Diego Hotspots with our Discount Charter Hourly Rates. All San Diego Charter Bus drivers are certified professionals and will make sure your Charter ride is comfortable and safe. For every everyday group travel, choose San Diego Shuttle Bus Rentals. 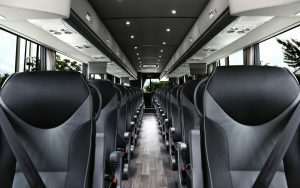 A 56 Passenger Shuttle Bus comes with Standard and Luxury individual seating, more than enough luggage space for long distance traveling to places like Las Vegas, Long Beach Cruise Port, San Diego Cruise Port, San Diego International Airport and more! We have perfected the way we price out Limo Transportation Services in San Diego. 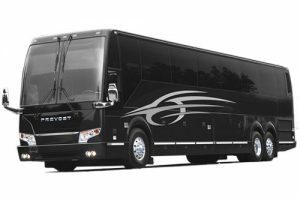 San Diego Limo Bus Rental Services 56 Passenger Pricing can easily be determined using our internal software with prices that have been intricately negotiated with multiple Limo Companies throughout San Diego. All Limousines, Sedans, and Buses are available with Point to Point Rates, One Way Transfers, Hourly Service Rates, and Hybrid Pricing.